Unlock Samsung E2370 Xcover - Safe IMEI Unlocking Codes for You! 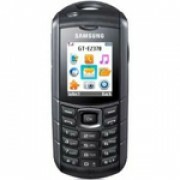 Unlock Samsung E2370 Xcover Handset! In case your E2370 Xcover doesn't ask for the code and there is no designated field to enter it, please DON'T PLACE ANY ORDER, contact us first for support. Unlock your Samsung E2370 Xcover and use it with Any GSM SIM Card worldwide! Our unlock codes works for the latest models of including Samsung Galaxy Beam I8530, Galaxy S 3, Galaxy Note 2, Infuse 4G, Omnia, Galaxy Skyrocket and more! We are able to unlock the most GSM Carriers including At&t, T-Mobile,Verizon, Rogers, Fido, Bell, Telus, Vodafone, Orange and many more! Please note that we will not make any refunds to you if you place a wrong order by not fulfilling the requirements mentioned above! The reason is because we support the cost for each IMEI we try to unlock! How to Unlock Samsung E2370 Xcover Phone - Tutorial! Please find bellow a step-by-step guide to follow in order to unlock your Samsung E2370 Xcover. In case your more phone doesn't ask for the code and there is no designated field to enter it, please contact us for support. Hi Santosh! The codes for your phone model are available, so please use the form if you decide to place an order. Thank you!